A photographer who was covering a Donald Trump rally in Virginia was reportedly thrown to the ground by a Secret Service agent, arrested and escorted out of the building. The incident, which was captured in numerous videos, begins when the photographer attempts to shoot a crowd of protesters. An Instagram video clearly shows the man being choked and then slammed to the ground. A second video then shows the agent standing over the photographer Christopher Morris, who is kicking him with both legs. "Are we having a good time?" 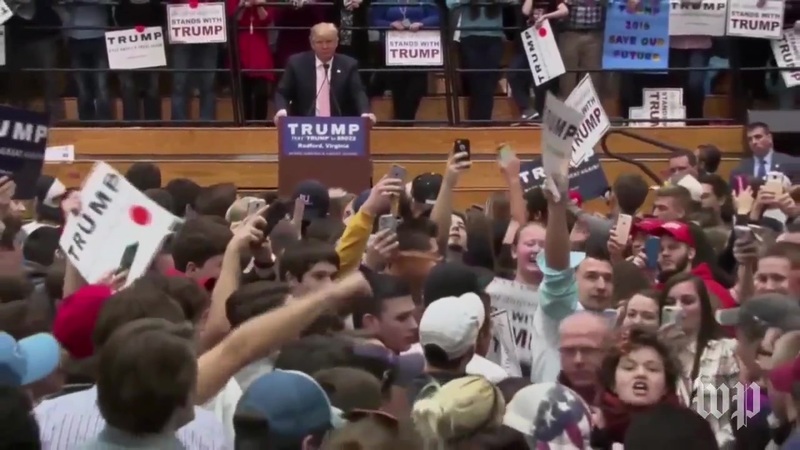 Trump asked his supporters as the incident unfolded, according to the Washington Examiner. Hearing @time magazine photog Chris Morris was just arrested at Trump rally. Seen tussling with Secret Service officer. Morris, a war photographer who witnesses said was on assignment for TIME magazine, accused the agent of choking him and slamming him to the ground by the neck. "He choked me," he told WSET reporter Annie Andersen while he was being shown the door. "I never touched him. At the very end I tried to show the press lead what he did to me, and I said he choked me, so I put my hand on him, and that's when I was arrested," he said. Morris was "credentialed press" and was trying to leave the pen to photograph people in the audience when he was forcefully stopped. "I stepped 18 inches out of the pen and he grabbed me by the neck and started choking me and slammed me to the ground," he added in a quick interview with CNN's Jim Acosta. Joe Perticone, an Independent Journal reporter who saw the incident described it as a "choke slam." Perticone told Mashable the incident did in fact occur inside the press pen. It was initially unclear if the security staffer was a member of Trump's Secret Service detail or a member of his private security team, though a statement from the campaign cleared that up, and referred further questions to law enforcement. We've reached out to TIME to confirm that the man seen in the video was indeed working for the magazine. We've also reached out to the Trump campaign for comment. The Secret Service's Public Affairs office referred us to a spokesperson's voicemail. Trump's campaign security has been criticized for roughing up reporters and otherwise restricting their access to his events in the past. A Huffington Post story in January included a comment from the Secret Service that said, "Any restrictions on press movements above and beyond security related procedures are designated and enforced by staff, not by the Secret Service."